Tomatoes prefer warm, dry summer weather to produce the juicy vegetable you slice for sandwiches and salads. But temperatures over around 85 degrees F can cause tomatoes to cook on the vine. When you select the tomato varieties you plan to grow in your summer vegetable garden, choose types that can endure the hot summers of areas such as the Southwest. The Roma paste tomato is a good choice for gardeners in California's Central Valley, where summer temperatures often climb to triple digits, according to the Redwood Barn Nursery in Davis. The plum-shaped tomatoes grow on plants that are determinate, so they remain compact in size, which makes them a good choice for growing in containers on patios and balconies. The Roma tomato is a good-tasting salad tomato, and its lower water content makes it appropriate for sauces. Several types of Roma tomatoes are available from seed catalogs, including Roma Napoli, Rio Grande Roma and Martino's Roma. 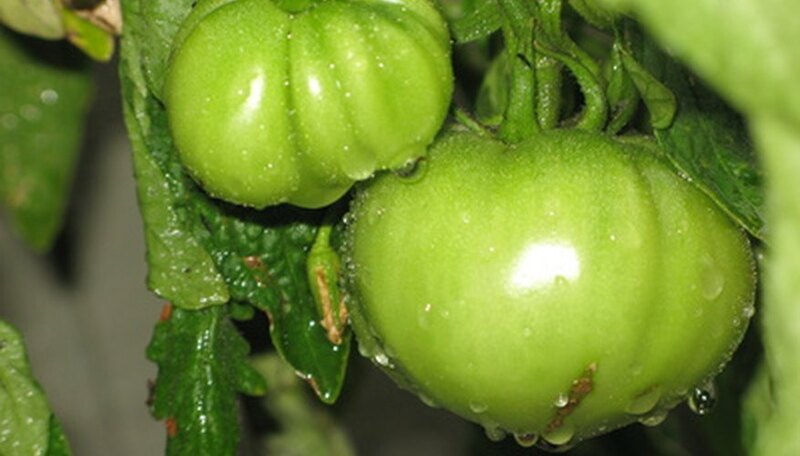 The disease-resistant Celebrity is a medium-sized tomato that likes the heat. It produces a reliable crop of 8-oz. tomatoes, according to Park Seed Company. It ripens earlier than some of the larger tomato varieties, and because it resists cracking, the Celebrity is a good choice for hot climates. The Gurney's Seed Company says this tomato is a good slicer, and its determinate growth pattern means the plant will remain compact throughout the summer. This hybrid variety comes from the University of Florida, which developed it in response to the need for a homegrown tomato that can withstand the state's very hot summers. It performs well when the mercury soars into the 90s, which would leave other varieties sunburned. The fruit is large and red and can weigh up to 9 ozs. It is also resistant to fungal diseases such as the wilts that can affect tomatoes, especially in humid climates. Redwood Barn Nursery recommends the Champion variety of tomato because it is the largest tomato they have found that does well in hot, dry summer weather. The fruit is sweet, solid and meaty and the plants are determinate. It will produce a heavy crop of tomatoes by mid-summer and continue to produce a smaller but steady supply of fruit until fall's first frost. Redwood Barn Nursery: Everyone Loves Tomatoes!